Dianors PCD-equipped Dead Centers MK-1 MK-4 has the same dimensions as centers according to DIN 806 and YOUR 807. This makes it easy for you to change your default Dead Centers to PCD-equipped Centres. PCD-equipped Dead Centers. 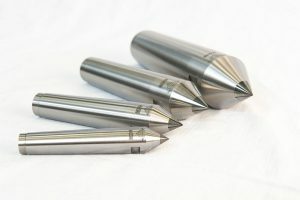 High-quality Diamond and Solid Carbide tools. PCD-equipped Dead Centers. 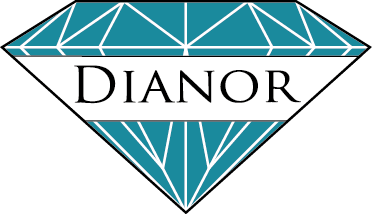 Dianor AB manufactures and performs the service of high-quality diamond and Solid Carbide tools. We will help you find the right solution for your needs. Grease or oil is not needed, cooling water is sufficient lubrication. 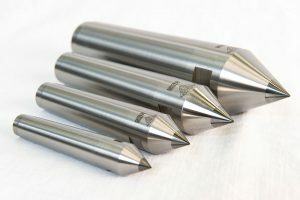 The Dead Centers consists of Solid Carbide which in turn is fitted with five PCD-veins. 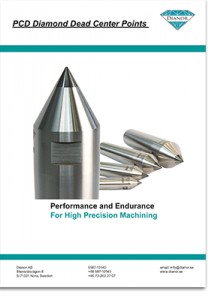 Diamond-tipped Centres has many benefits when it comes to precision machining that is grinding and hard turning. PCD (PolyCrystalline Diamond) is apart from solid diamond the hardest material in existence. PCD is also superior when it comes to low friction and have very good heat absorption. 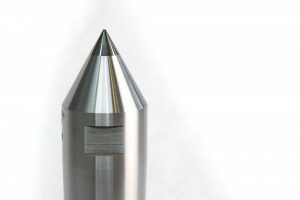 This facilitates, among other things, grinding operations where it is common with long cycle times which in turn creates a heat problem with standard carbide centers. This is avoided with Dianor Diamond-tipped Centres.